"With 25 years economic development experience across the public and private sectors, my role as Chief Officer of Scotland's Towns Partnership is to drive sustainable change through collaboration and partnership. Towns are clearly back on the political agenda and our work in helping to deliver the Town Centre Action Plan has delivered a step change in thinking and tangible progress. Scotland's Towns and smaller settlements account for 70% of our population base and aside from their significant economic contribution in terms of commerce and employment, they provide a living record of our history and heritage, they provide places where communities can meet, socialise and celebrate culture, and are hubs where people can live, access services, leisure, entertainment and transport. Despite the numerous factors and pressures impacting on our towns I believe that empowered communities can be energised to ensure that Scotland's towns remain vibrant and continue to play a vital role in our nation's future." 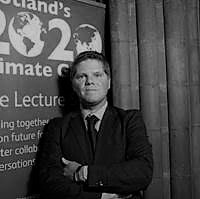 "I am Professor of Retail Studies and Deputy Principal of the University of Stirling. I am the current chair of Scotland’s Towns Partnership, a role that has followed on from a longstanding interest in place and community and involvement in the External advisory Group for the National Review of Town Centres (the Fraser Review). My academic work is mainly in retailing, but increasingly it involves aspects of retailing in towns and places. I am one of the drivers behind the Understanding Scottish Places work (usp.scot) and also run a retail blog which encompasses a lot of our towns work (stirlingretail.com). On the blog you can find copies of presentations, articles and other aspects of my retail and towns work. Towns are the fundamental heart of Scotland, being the place where social and economic value can be best delivered and promoting a sense of identity and place. Everyone comes from somewhere and most people come from, or associate with a town. They need to be nurtured and re-energised to meet modern needs and to strengthen community life". Mhairi Donaghy is Associate Director at EKOS Economic and Social Research and leads all of the practice’s regeneration and place development studies. She has considerable experience of towns and town centre research, having delivered a wide range of studies over many years including place audits, strategy and action plan development, project appraisals and funding applications. Mhairi has a very strong interest in towns as a service user and shopper, as a visitor, and as an economic research practitioner. She worked with her local Business Association over many years, latterly helping the group to secure a successful ballot and establish the ‘My Shawlands’ Business Improvement District (BID). Towns are essential in bring together the facilities and services that people want to use in accessible places that people can get to – this helps to promote variety and encourage innovation. Successful towns have a distinctive offer, are vibrant places, and encourage people to visit through activities, events and marketing efforts, helping to sustain business performance, create new jobs, and strengthen community ties. Where they can define their purpose and exploit opportunities, all towns have the potential to build a more successful future. Tom is currently treasurer to Scotland's Towns Partnership. "As an architect in private practice and as a Director of the Development Trusts Association Scotland [DTAS] I represent both the active practitioner and the can-do community-led ethos of DTAS on the board of STP. I’m interested in towns because like almost 70% of our population, I live in one. Towns also provide 2/3 of our jobs and businesses and should be the powerhouse of our economy. Our towns are the barometer of the nation’s economic health and social wellbeing. Getting our towns and town centres right is important not only for that particular place but also for a socially inclusive and vibrant national economy. Therefore, towns matter – they matter a lot. Towns form an important and integral part of Scotland’s landscape. Big towns, small towns, beautiful towns, unremarkable towns, seaside towns – the list goes on. They provide a broad diversity in terms of size, scale, location, landscape setting and character including layout and building fabric. Towns are the lifeblood and sole economic drivers to many rural areas and are essential components to the hinterland of our 7 cities. There is a great deal of pride in Scotland’s towns, which offer a way of life at a scale, which is often rich in identity and social interaction with a deep local sense of place. The opportunity exists to harness this local pride, knowledge and enthusiasm to improve the overall social, economic and physical environments within these places". David is a senior BT executive who heads up the Public Sector business in Scotland. His remit is to implement a new strategic direction to increase local focus nationwide. David is part of the BT leadership development programme. He is passionate about supporting SMEs in Scotland and is a non-executive director and advisor to a number of these. An industry veteran with over 30 years international experience he is originally from Bo’ness and now lives in Edinburgh with his young daughter. Why towns are my interest: Modern towns face tough challenges, with rising populations and rapid growth putting pressure on local services, housing and transport. Smart use of technology, including data collection and interrogation, will help address these big issues. Collective action is needed to help Scotland’s towns to thrive, and being part of STP is important to explore how ICT can contribute. One way or another, BT is a stakeholder in every community in Scotland. The rapid expansion of high-speed services will revolutionise work, leisure and the economic life of our towns and places. I am Policy & Communications Manager, Sustrans Scotland. I am interested in towns as places where people live, work, play, meet and socialise. I am also very interested in the role the urban environment plays in promoting people’s health and wellbeing. interested in how making towns good at a human level, by making them attractive for walking, cycling and visiting, can in fact make towns good for business, for housing, for families, children and visitors. Towns occupy an interesting space between rural and city-dwelling. Many have the challenges of a large urban environment (traffic congestion, lack of green spaces, pressure on services) but without the advantages of a larger city (own local authority, good public transport links, wider range of facilities) . Making towns more people-centred, with good walking and cycling infrastructure is key to making towns successful, and overcoming the challenges of an urban environment while taking advantage of the benefits of shorter travel distances.